Sen. Gary Winfield, D-New Haven, gets emotional as he speaks on the paid family and medical leave bill Tuesday. 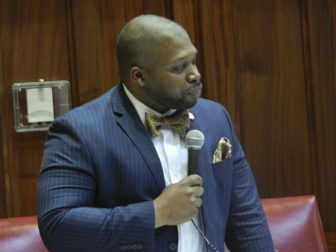 The Senate devoted about an hour and a half Tuesday night to a symbolic debate on a bill to guarantee Connecticut workers between two and three months of paid family and medical leave. It was tabled at the end of the discussion. The bill had been a top priority for Senate President Pro Tem Martin M. Looney, D-New Haven, who designated it Senate Bill No. 1. It gained little traction in a legislative session dominated by an ongoing budget crisis and concerns about the state’s business climate. The bill is one of several controversial pieces of legislation debated on the floor of either the House or Senate but not allowed to go to a vote because they lacked the votes necessary for passage. The bill would have required, with some stipulations, businesses of two to 49 employees to provide eight weeks of job-protected family and medical leave during any 12-month period. Business of 50 or more employees would have to provide 12 weeks. The cost would have been paid for through payroll deductions, though deductions would have been capped when an individual’s income reached $127,000. Sen. Beth Bye, D-West Hartford, in her speech urging the bill’s passage, said other states in the Northeast have adopted the same law without any repercussions for their business climates. Bye said people move to, and stay in, Connecticut because of its progressive policies. No senators spoke against the bill before it was tabled.